Since the end of blogging my school lunches, content here has been a bit of hodge-podge. I’ve blogged a bit about everything (lunches, food, ads, personal stuff, book club, etc). I’m curious and would love your opinion so I put together this survey. Please click here to take survey and answer just six questions. Thanks! Anyway, one of the moms is going to write a letter about how she feels about the menu (this is one of the moms who doesn’t know about my online identity). I encouraged her even though I’m not sure she’s going to get much traction. I know that I was told that I needed to provide food for my child if I wanted him to eat something different than the menu. Additionally, I ended up having to provide an official doctor’s note to opt out of the daycare food. Ah huh. His own mother couldn’t pack a lunch and snacks without doctor’s approval. Anyway my husband made jasmine rice again. It was great. Some of you asked for a recipe. He photocopied it from the library and I can’t figure out which book it came from. I want to give credit where credit is due. It’s called “Caju Pullao,” but I can’t find an online listing for a recipe with that name. Anyway, it was good. My husband bought sweet potato fries in a bag at the store. In and of itself, not a bad purchase, but now that I can make these at home myself, it’s not a convenience item we need to purchase. They were fine. I pushed the limits of the daycare rules by sending my son with chicken sausage. I was told no sausage due to fears over choking. I never knew how serious that was until an ER doctor commented on the blog about seeing kids choking at the ER on graps. The daycare menu often offers “diced ham,” so I thought if I chopped up the chicken sausage into little cubes maybe, just maybe, I could get away with sending that. No one said anything so I think I was ok. Phew! He didn’t eat much of the sausage though. 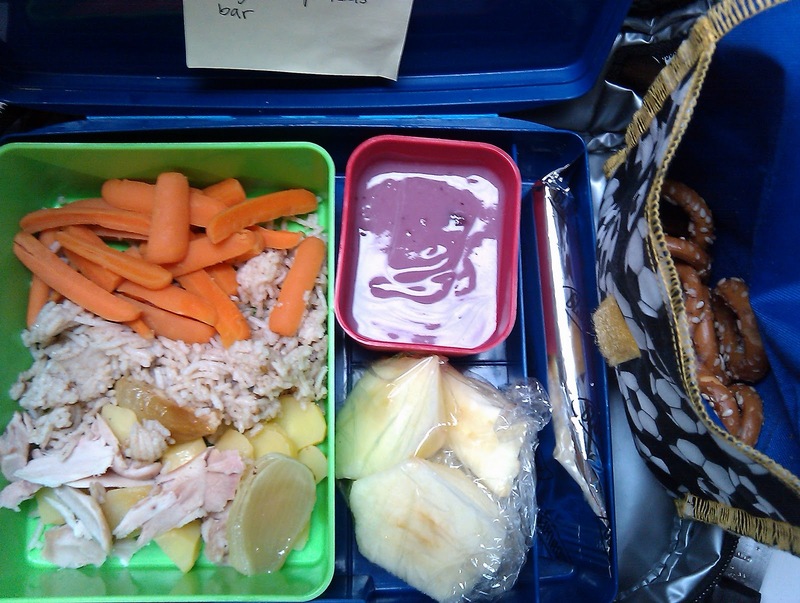 The daycare menu was ground beef, rice, bananas, diced carrots with snacks of yogurt, and pretzels with cream cheese. I’m using Jamie Oliver’s Food Revolution cookbook for the roasted chicken/vegetables recipe, but instead of a whole chicken, I just used about eight drumsticks. They were soooo tasty. silver bag with crackers, snack bar, and the rest of the crunchy green beans. My husband made that baked lamb dish again with onions and a yogurt sauce and this time he didn’t burn it. I know it looks like poo in the photo, but it turned out to be fantastic. I’ll have to see if he can find the cookbook where he got all of these recipes. The prep was outrageous, working late the night before to prep the meat. But I know it was worth it. He told me that getting it right was a huge confidence boost. Daycare menu was American cheese sandwich, tomato soup, mandarin oranges, peas with fruit to drink and cheese and crackers. The mom that is really pissed about the ice cream is also mad that her kid got processed cheese twice in the same day. No joke, right? Hello monochrome, yellow meal. At least it didn’t taste boring as these are favorite foods of my son. Daycare menu was diced ham, mashed potatoes, appleasauce, green beans with snacks of fruit and ice cream. I’ve been eating more salmon and sardines because I’m trying to get my Vitamin D levels to go up. My son saw me eating sardines in the kitchen and demanded some. I offered sardines to him a long time ago and he refused them. But when it appeared like Mommy was hiding a food from him, well then he had to have some. So I sat down with him, I showed him how to take the bones out (fascinating for a two-year-old), and he gobbled down 1.5 sardines. Ever since then whenever I’ve asked him if he wants to eat sardines with Mommy he says, “cited!! !” (excited) while smiling and waving his hands around. So I sent sardines in his lunch. I bet his childcare providers were shocked! I’m going to write a letter to the daycare and ask them to survey parents about their food preferences. I’ve been taking my son there for 18 months and I’ve never completed any kind of survey. Notice my son got a packed lunch on Monday, but I had a home lunch? Yep. He went to daycare while I stayed home for MLK Jr Day. Even better? My husband had Monday off too, which came as a surprise to both of us. Monday was a very nice day indeed. I loved eating lunch with my husband and without our son. It’s a rare treat, but wonderful to have adult conversation. Of course our conversation is all about our boy, but still. I like baking more than I like frying. Roasting and baking in the oven is just more tasty. On Friday night, we did salmon with just olive oil and salt. Amazing. Yum! I don’t need variety. That pasta is really good. Love me some eggs too. When I open up a yogurt for my son and pour it into a container, there’s some left over, which is often not enough for me to save for my own lunch. So I just scarf it down for breakfast. There was enough of the chocolate yogurt left so I dumped it into a container and swirled in some raspberry — terrific combo. I spooned the tuna into the pita and we were off and running! I'm curious about the "bars." What are they? My son has a milk allergy, too. It's a new thing to our family and it breaks my heart to see him have to eat differently and feel left out. Can you share your Mac and cheese recipe? That's one thing I'd like to give him to feel more like the rest of the kids. I wish I had food like this for lunch. Your son is so adorable! I wish I could have seen how excited he was about the sardines. When I ate school lunches, I didn't eat the cheese because sometimes it looked like plastic, shinny orange food doesn't look so pleasing. Hello again Mrs Q! I'm sorry I have to post this in two comments as there appears to be a limit on how many characters you can have…yikes! I've kind of just wanted to state a few things about day cares and lunches from a different point of view. I've worked in a day care setting for a few years as a lead teacher and as a director. BOTH facilities that I worked at offered meals and snacks. There were two VASTLY different things about each center in regards to how food was served. The center that I was a teacher at, I'll call the "higher end" center purchased food out of their own budget. They bought prepared foods from a vending company and the woman that prepared lunches considered herself a "professional reheater". Veggies and fruit came from cans and the main part of the meal was always frozen. Snacks were of good variety and included fresh fruit, fresh veggies, your standard Goldfish, graham crackers, snack mixes and every once in a while a pudding. Ice cream was only for special occasions. Parents could choose to bring an alternative lunch if they wanted (and many did for food allergy purposes and even just because) and there were even alternative lunches for kids that didn't like what was on the menu. If a parent wrote to this center and asked for a survey to be done about the food, would the administrative do it? I'm going to have to say probably not. These people own a chain of centers and what they do, they do well. There's a reason why there are staple foods on the menu; cost, the taste of the children and to be honest how many parents would actually sit down and complete the survey? It probably would not be worth the efforts for them to put something out. The center I was a director at was funded by a program called CACFP or Child and Adult Care Food Program. This is a government funded program that reimbursed facilities for food. It had guidelines that had to be met in regards to what was served. I actually toted this program in my sales pitch when trying to recruit new families. It's very similar to a school lunch program but what's wonderful about it is there is really no way around NOT serving whole foods (unless you want to pay more to get the "certified" processed stuff). Our food lady was an actual cook. She made her own chicken tenders, mac and cheese, beef stroganoff etc. This center was a lower income center, we had many families that received county assistance (I had a few families living in hotels) so it was nice to know that those kids got a full, good breakfast (as opposed to a snack), a healthy lunch and an afternoon snack. I would've loved to have surveyed my parents on the food choices in the center, and I also wanted them to be as educated as possible ABOUT the program. However, if a parent wanted to provide their own lunches (or I had a case where the child was SO picky I ASKED for the parent to provide a lunch) I would've required some sort of documentation. CACFP is a government program, as in I had to record how much food I used each day, how many kids were in the facility and how many actually ate the meals. I needed to be able to explain why Johnny wasn't served a meal in case of an audit and if I couldn't do that well, that could open a whole new can of worms. So anyway, I guess my point would be for parents to find out how their daycares go about choosing the foods they serve. Do they participate in CACFP or do they just buy it on their own? It may help to explain some of the rules they have about bringing foods into the center. Now some of the stuff you're saying I think is totally off the wall, sausage a safety hazard? Well teachers are there for a reason, they can cut it up…that I don't get it at all, but having to get a note signing off on bringing a lunch, that I get. Also parents need to keep in mind that a lot of centers don't offer ANY food. Childcare is EXPENSIVE (I read a statistic that said by the time the child is aged 5 the average parents would have spent a college tuition's worth of money on child care) and to be served ANY kind of food is a bonus. It's kind of like schools, they really don't HAVE to serve your child anything. Which could be a blessing for parents that feel their children deserve better but as a reduced lunch kid myself, I wouldn't have HAD lunch if my school didn't provide me with one. If parents are really unsatisfied with their providers lunches I'm going to have to say, shop around. How many day cares did you look into before you chose the one you ended up at? What initially made you choose that center? How much do you know about the food program at your center? I say this because day care center directors/owners/teachers/assistant teachers/employees are BUSY people they don't have TIME to think about the food their serving, half the time they don't even have time to get someone qualified in the kitchen to cook the food let alone someone to come up with and monitor a survey or complete a haul over of what their current system is. YOU as a parent have choices, the day care might not have the option in as quick and efficient manner as you'd want them to. Wow! You can get mandarin oranges that aren't in a can??? Amazing! I thought they were clementines until I read the caption. Your lunches all look fabulous and give me some great ideas!! Thanks! Just wondering why you use so much plastic wrap when you have the nice laptop lunchbox containers? Some of them do have lids. It's much less wasteful for the environment to use lidded containers compared to all the plastic wrap. Okay… here's a question you may have addressed, but seeing the foods this week, I was curious… are all the meals designed to be eaten cold, or does the day care heat up the meals for him? We have our daughter at daycare, but she's got a straight diet of formula right now, so not a lot of straying. However, I believe the food/meals they serve eventually are free. But I'm pretty against my daughter getting "desserts" for regular meals. Healthy snacks, yes, ice cream and cookies? No. My daycare puts up with us (we're exclusively cloth diapered), but I can't imagine her still in cloth AND "outrageous" food demands. I guess I can always lie about food allergies? I love how your son at such a young age eats sardines. I must say, this goes to show that when you introduce foods that aren't familiar to a children at a young age they are more likely to try the food. Huge kudos for teaching him to take the bones out. These days I feel like people take the easy way out when it comes to food in general. I love that you show through pictures how simple it can be to make meals for mom and dad as well as for children. And like you said, baking foods is much more healthy, flavorful, and talk about taking the easy way out? You just put it in and forget about it. 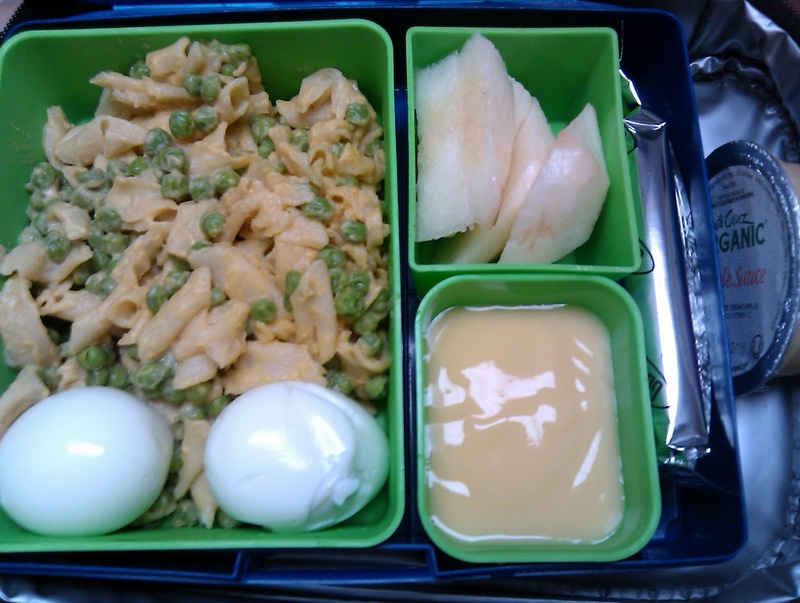 I wish I hd the time to pack such yummy lunches for myself as you pack for your son. I can't believe they made you bring a doctor's note in order to pack his lunch… It's less work for them in the end if he brings a lunch anyways! I would not be amused by my toddler having ice cream for snack on a regular basis. Ice cream is a dessert ot a treat, not a regular snack. My eight year old eats dairy on a limited basis. He is not allergic or even intolerant, but I don't believe that people were really meant to ingest cow's milk.. We are the only species that drinks the mothers' milk from another species. Anyway, we do not have dairy in the house, and I pack his lunches, so dairy consumption is mainly in restaurants or at other people's houses. He loves both soy and almond milk. 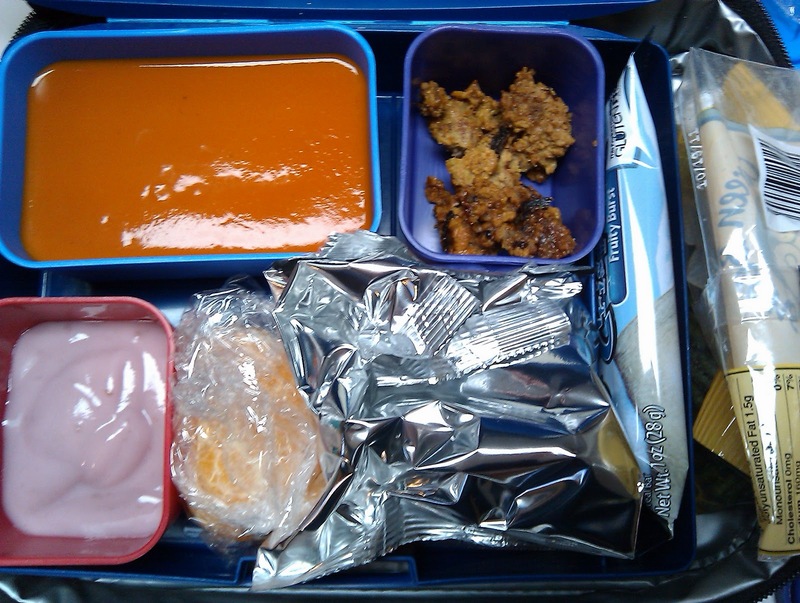 The school lunch where he goes to school has a meal choice that contains, yogurt, cheese stick, milk, and fruit. It may have crackers or something too, but I am so grossed out by so much dairy in one meal that I can't focus on what else it conatins. 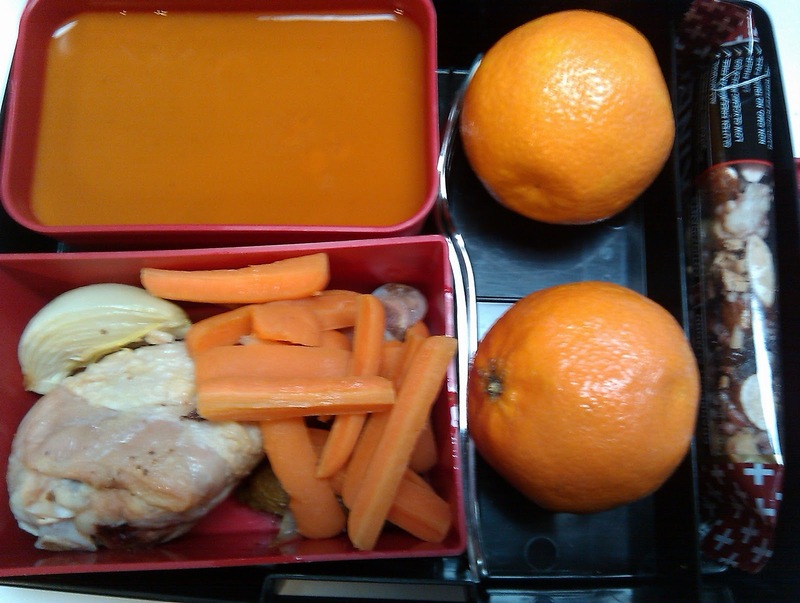 It's meant to be a healthy choice, and the county claims to be focused on healthy eating, but the lunches are just not. I am gluten free also, and was wondering about the pita, where did you find it gf? Or is it home-made? Thanks these are great ideas for my lunch at school! I normally just take yogurt and salami, or cheese and crackers, sometimes even a gf pasta salad with artichoke hearts and chicken! All your lunches look delicious and give me some great ideas! 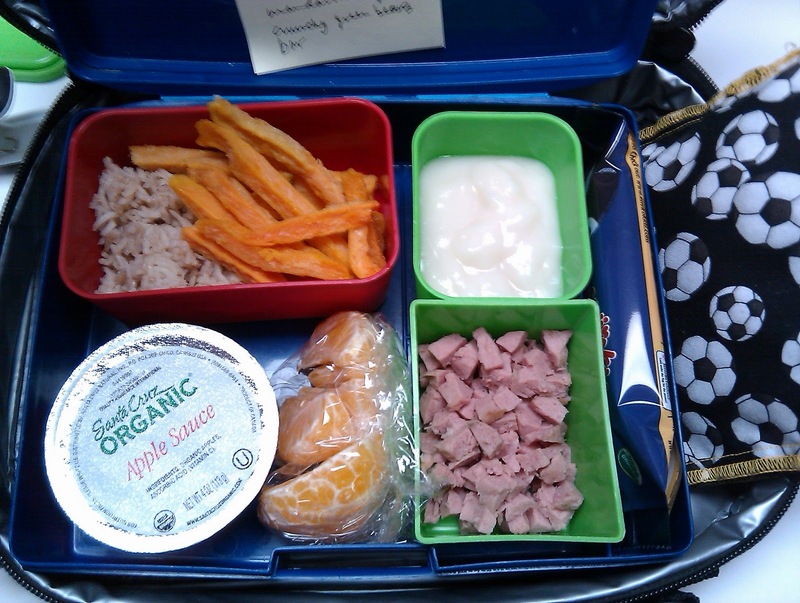 I wish I had the time to pack such yummy lunches for myself. 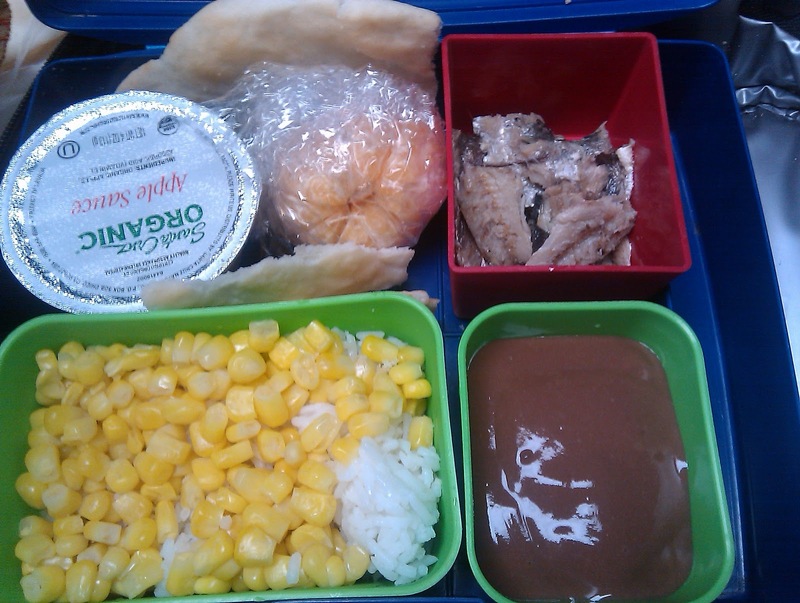 As a fish and shellfish allergic, I always get worried when I see fish in a packed lunch — especially a school lunch. I certainly hope no one in your son's class is fish allergic! Yum to the hardboiled eggs. My grandmother used to pack hardboiled eggs for us whenever we went on excursions, and to this day I can't get enough of them. It's good to see that other people take them for lunches/snacks too. It's such a good (cheap!) source of protein that I don't understand why eggs aren't more common. I agree–that's insane about the ice cream snack. Would it really be so unheard of to switch to yogurt or string cheese if they want a dairy snack for kids? Or why not fruit bars instead, if they want it to feel like a treat? Do kids really need such astronomical amounts of sugar on a daily basis? You'd think that, considering it's the STAFF who have to deal with all those sugarspun monsters after ice cream day, they'd avoid ice cream like the plague. Weird. 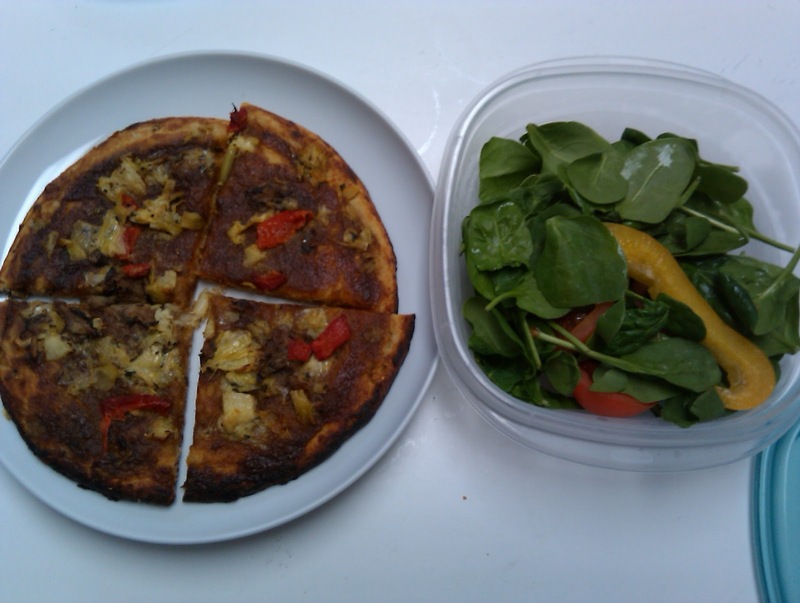 I hate to say it but the pizza in your lunch this week looks a lot worse than a lot of the pizza you ate at school. That is completely ridiculous that a doctor's note was required in order for you to pack your son's lunch and opt out of the junk they were serving at the daycare. Ice cream as a "snack"??? really?????? I just cannot get over that. Every time I see it posted on your blog that ice cream was offered I just cringe at the thought. It should be a rare treat "Ice cream day" or whatever… when it's not January. Maybe I'm crazy, but I can't fathom how your son eats that much…I'm a fat adult and I can't even eat that much…even when I was 7 or 8 and could eat prime rib like it was going out of style, I doubt I could stomach that much food just for lunch alone. It's great you're taking his nutrition into your own hands, but it really seems like it's a bit much. On an aside, a doctor's note to bring his lunch? WHAT? I don't even comprehend. Would you consider one week alongside the photos of your son's lunches also breaking down the cost of the lunch? Cost is a major factor in packing and buying lunches. 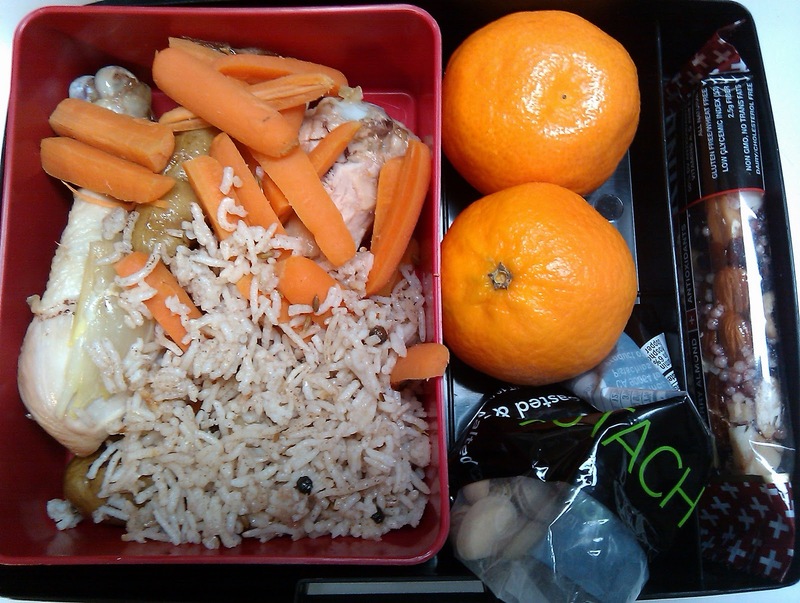 I'm wondering whether you'd accept the challenge to prepare these healthy lunches with a much smaller budget. 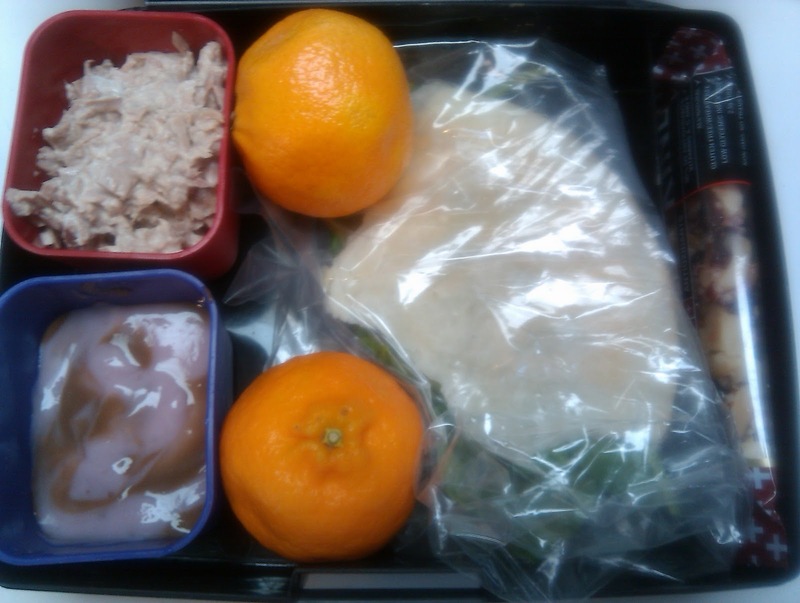 Could you pack a healthful lunch for your sun with snacks for 2.00 or less? I hope you do except the challenge because if anyone can do it, you can! Vi, I assume that the food shown in the pictures is for a whole day of eating, i.e. lunch and 2 snacks, and not just for one lunch. Also the boxes seem to be fairly small, using the top of the yogurt container as a reference, so the portions must be small. Otherwise, I agree with you that there would be far too much food. that is a huge lunch for your little man (even if some of that is snacks). i know many parents worry their kids won't find something they want to eat in their lunch box, so they include a lot of variety and choices. too many choices for very young kids actually stuns them. he might eat more of the protein if you send fewer options. i used to eat lunch with my preschoolers at daycare and the kids that had a bunch of items would open their box and stare at it. it's hard for a preschooler to decide what of 6-8 items to eat first, and even harder to "finish" a serving of anything when there are a lot of choices. one veggie, one fruit, one protein, one drink should suffice. 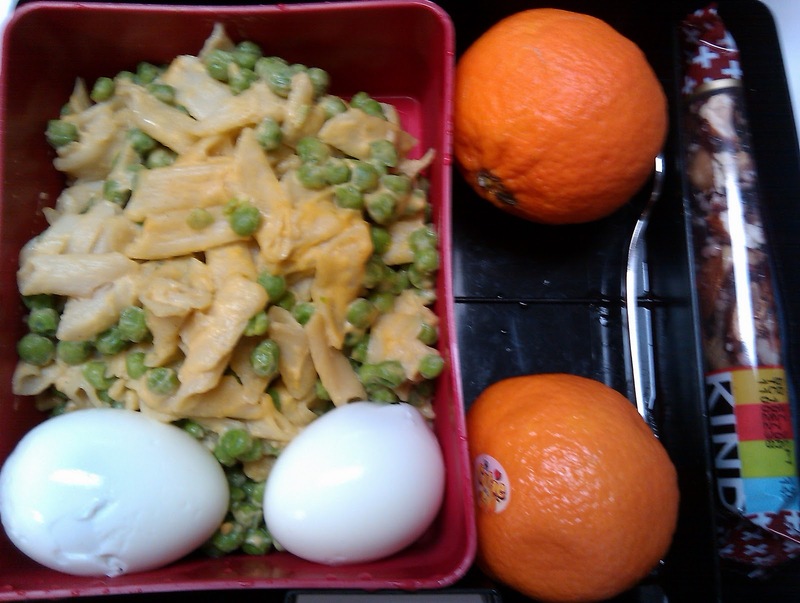 even my sons (now 5 and 7) tend to eat less food when I send more than 3 items in their lunch. my preK kid does better with just two items. give fewer options a whirl for a week and see what happens. good luck! Great lunches, indeed. Would you mind sharing the "mac & cheez" recipe? It looks quite yummy, I bet my kids would love it. I know you said you buy the flavored yogurt at WF, but I cannot seem to locate it at my WF. Maybe I am looking in the wrong area. Is it a particular brand? Vi: This is a snap shot of what her little guy eats over the course of one day while he is at daycare. With the rules about sausage/hotdogs that many daycares have, it isn't about the contents, it about the choking hazard of the shape of the food. Chopping it up in small pieces eliminates that risk, so you should be able to send sausage and or hotdogs. I can't believe how often the daycare serves ice cream for a snack! I agree with an above poster, what about string cheese, yogurt or frozen yogurt instead? What would the goal of the survey? Do you think parents would pay a bit more for daycare if the food were better? Would you be willing to only substitute the wheat and dairy items if your daycare would improve the quality of its food? Would it be worth it to you to look for another daycare that would do that? We have a home daycare that serves great food- freshly prepared, and the veggies are frozen if not fresh. When we were concerned about our son having a dairy allergy, we would get a copy of the menu ahead of time and send substitutes for only the items that had dairy. Just a thought if it would make your life easier! When I get the menu, I am jealous- lots of homemade soups and yummy dishes. Wish I could eat there! I agree with a few of the previous commenters that your mac and cheeze recipe would be really helpful! I have been off dairy for around 7 months and certainly miss mac and cheese! Just thought I would let you know that you can eat the bones in sardines. They are soft and you don't even notice them. They provide an excellent source of calcium which would probably be great for your son since he is dairy free. If you don't like them I totally understand just thought I would let you know that it's perfectly fine to eat them and not really noticeable. Keep up the great work!! I loved all kinds of crazy stuff when I was little and my mom would pack my lunch for my daycare and they couldn't believe I would eat beets and brussel sprouts. Still love an all natural varied diet today as an adult and often have people comment on my lunch at work. I think it's great you are teaching his teachers at daycare about new foods! I noticed comments on the plastic wrap. I just started using reusable fabric bags lined with nylon for when I bring bread/crackers in my lunches and they are great. You can find them all over the place now, I got mine at my local co-op, but here is a site http://www.semillasnackbags.com/. What is the box/bento set that you use for your son's lunch? The "mac and cheeze" was not homemade!! I'm really sorry if I led you on — I thought that some of you might recognize the name of the "fake" cheese. It's from a box: the company is Road's End Organics and I buy it at Whole Foods. The box is from Laptop Lunches. I'm probably going to split these posts up into two in the future! It's pretty long. Thank you for the lunch wrap up posts! They give me great ideas for what to serve my own son. Looks mostly awesome, but, even though kids like them, I'm not sure having some sort of "bar" is a good idea every single day. There's an intense amount of sugar in those, usually. Just a thought that maybe they're not a good idea as a daily habit. Do the laptop lunches keep the food warm, too? The laptop lunches don't keep the food warm. You have to zap it in the microwave.